Sometimes you just never know what the next minute might bring to your life. One lucky resident of Blue Ridge found out how it could forever change the future. 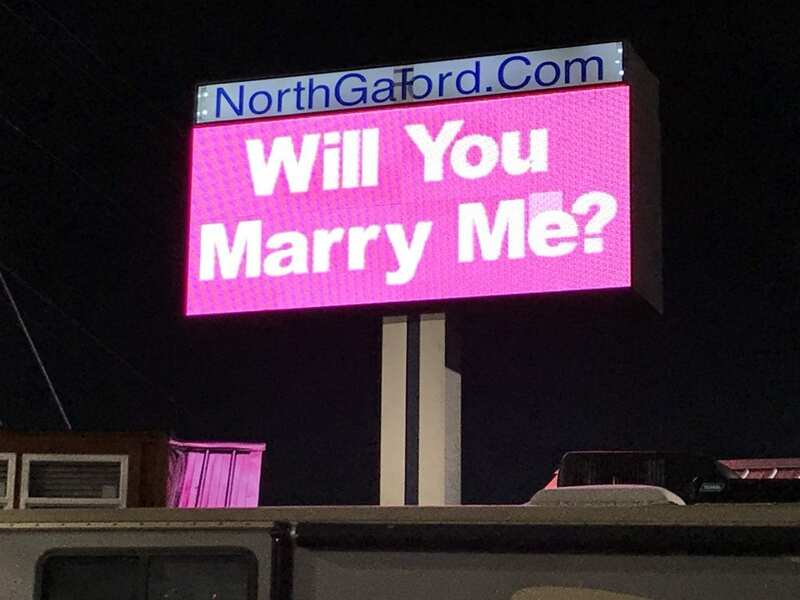 Edward Bell appeared nervous as he paced the showroom floor of Blue Ridge North Ga. Ford (BRNGF) in Mineral Bluff on Friday, Jan. 25, 2019. Along with his co-workers, he was waiting for the arrival of Kelsie Ware. In minutes, she would be returning to Blue Ridge from her job at Brown Haven Homes in Hiawassee. 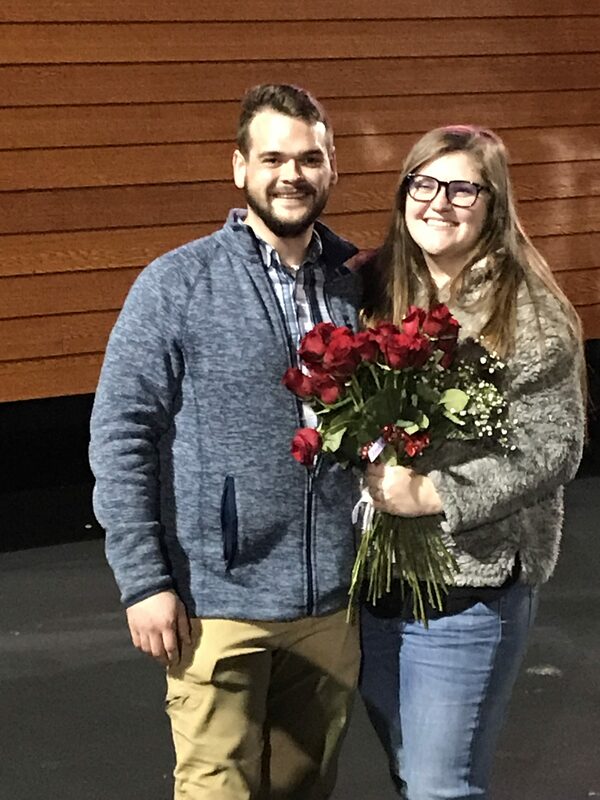 The evening was going to be very special and life-changing for them both. While candid in his interview, he explained he was named after his grandfather, Edward Bell. What he intended to give Ware was an heirloom his grandmother, Helen Bell, wore when she celebrated her Fiftieth Anniversary renewing her wedding vows to the love of her life, Edwin Bell, Sr. She had Stage 3 cancer at that time with only a few months to live, so this represented something very special to his grandparents and his family. His grandfather “made it a point” he received the special heirloom. 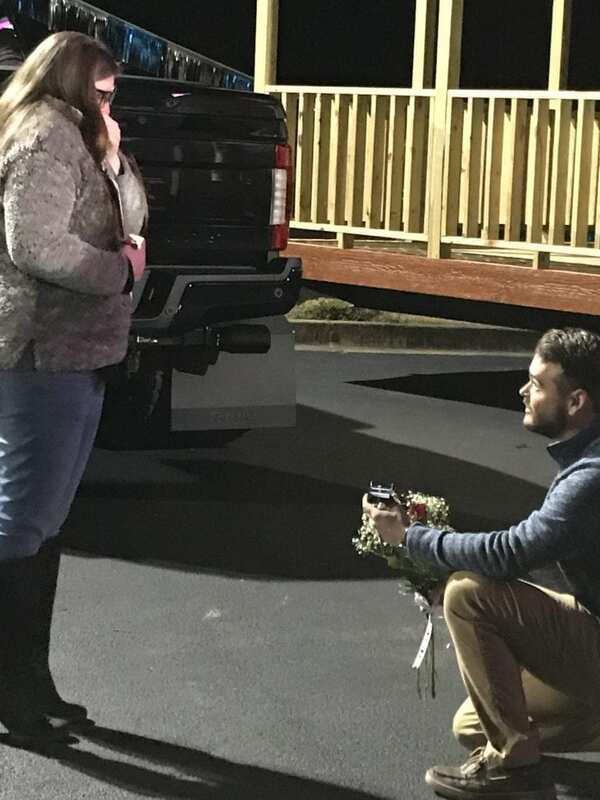 Bell’s chivalry upholds a Southern gentleman’s standards; he asked Ware’s father, Brent, then her step-mother, Beth, and brother, Brice; all approved. Tim Ford, BRNGF’s owner, and his staff helped Bell prepare for this special day. Ware was told she would be witnessing a fly-over of AC 130s for a night light show. 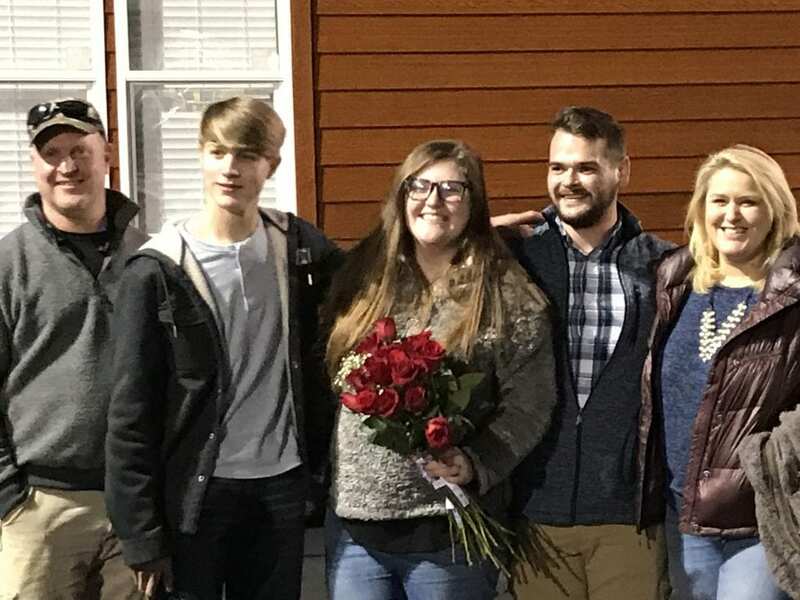 What she did not know is her parents and brother were in on the surprise. 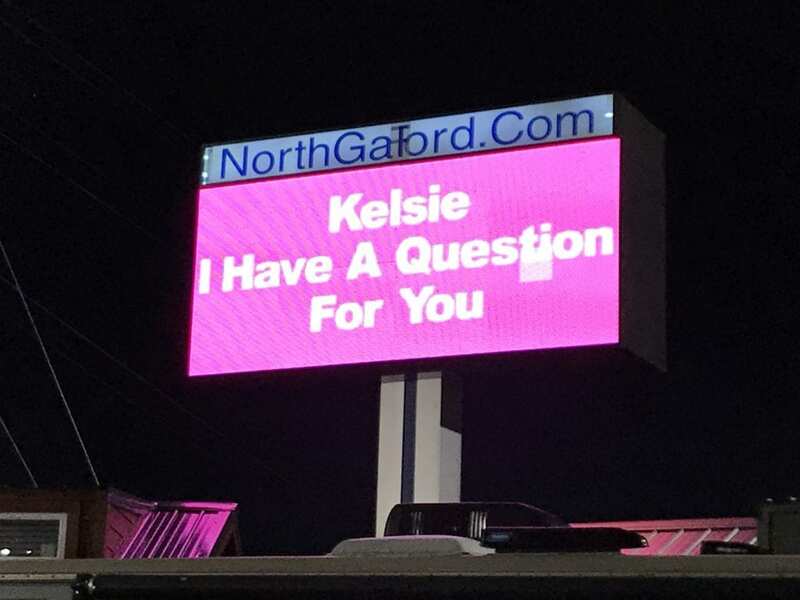 Kelsie, I have a question for you. Bell had also been hiding, waiting for Nash and Ware to head back to the office. 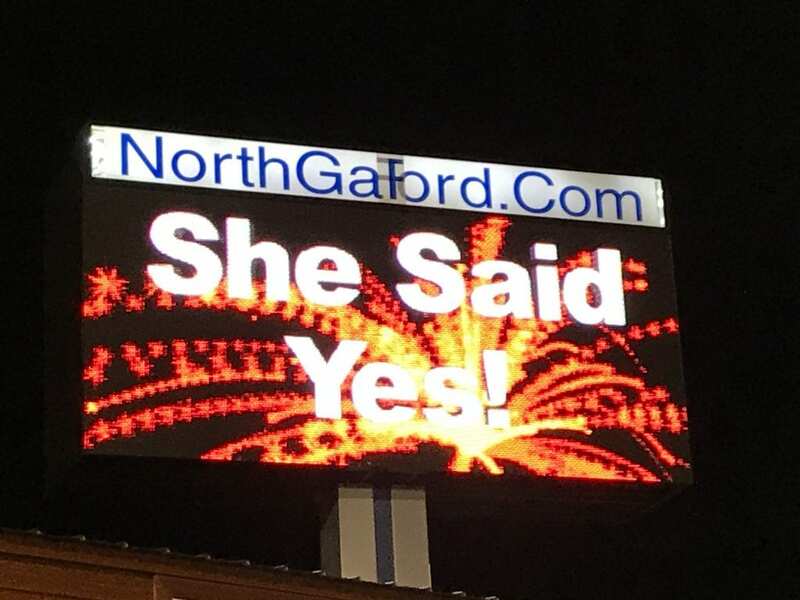 After allowing Ware to read the marquee, Bell came out of the shadows, knelt on one knee to ask the love of his life if she would marry him? 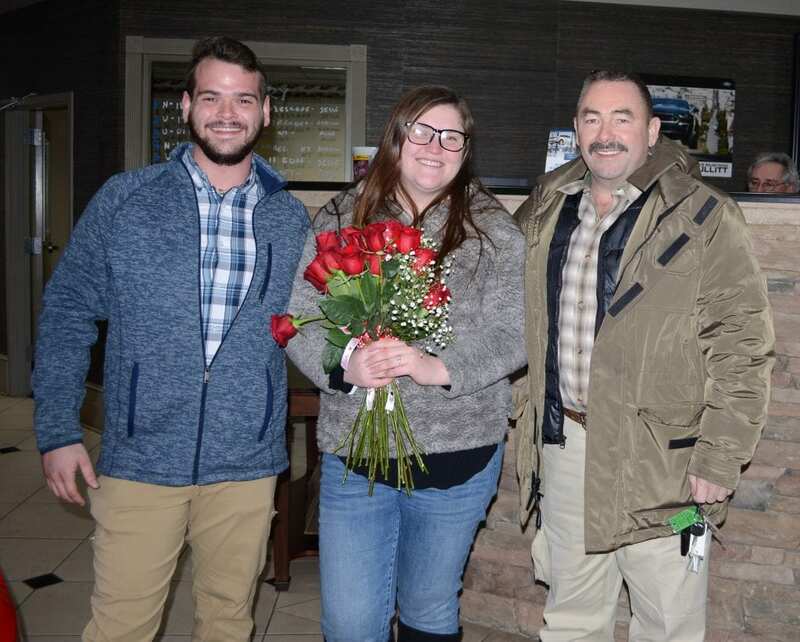 He presented her with the heirloom ring his grandmother once wore along with a beautiful bouquet of roses. 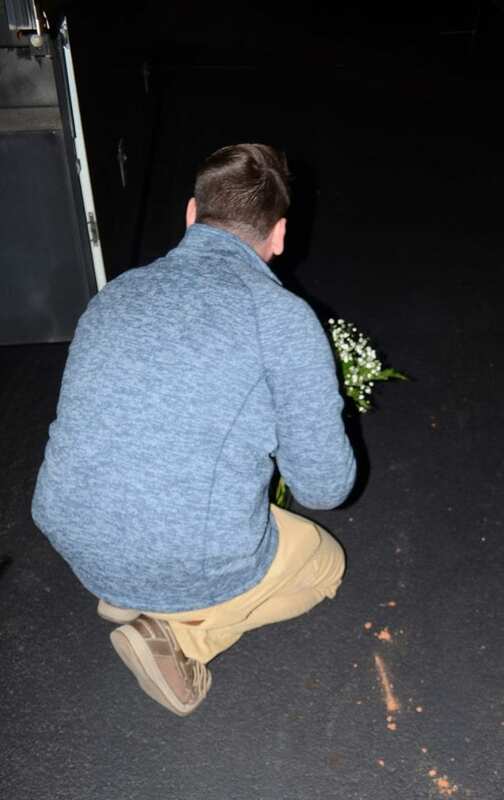 Behind him, her immediate family members also emerged to witness and hear his request. 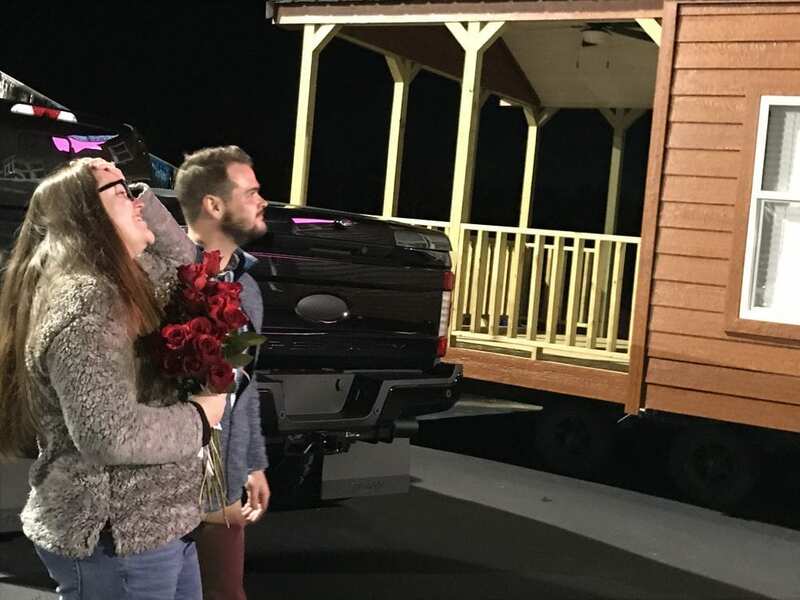 As family and his co-workers watched and waited each witness had a single rose hidden behind their backs to be presented to Ware after her acceptance. They would express their congratulations for the couple and add a rose to her bouquet. Once back in the office, Bell showed everyone something special. Not only did his grandparents gift him with the treasure of his grandmother’s ring, but also the one his grandfather proudly wore. This is the ring Bell will wear. Bell, 23, and Ware, 24, are from Blue Ridge, Ga.
Ed Bell waiting in the wings for his future fiancee. Kelsie Ware and Ed Bell looking at the marquee. Next Article » New bridge to be built on the busiest stretch of Aska Road- Are families now at risk?